News is a major part of Reddit, an online discussion forum that calls itself “the front page of the internet.” The site has hosted Q&A sessions with newsmakers from President Obama to Amy Poehler, and it sends many of its millions of daily visitors to news sites and other publishers. 1Just 4% of U.S. adults are Reddit users, but seven-in-ten Reddit users say they get news on the site. Nearly half (45%) of Reddit users report learning something about the 2016 presidential campaign in a given week on the site, a share comparable to those of Facebook and Twitter users and higher than other social networking sites. 2Fully 47% of Reddit news users consider themselves liberal, compared with just 24% of all U.S. adults. In addition, they are especially likely to be young (59% are 18-29 years old) and male (71%). 3 Overall, Vermont Sen. Bernie Sanders was mentioned more frequently than any other candidate in May, June and September of 2015. 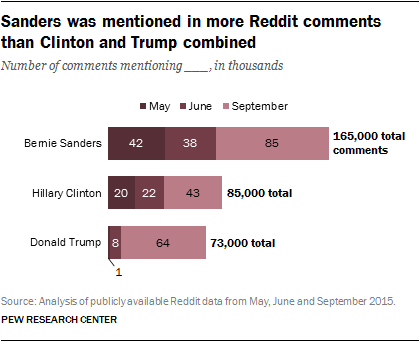 Sanders was mentioned in about 165,000 comments, more than the number of mentions for the next two highest candidates combined: former Secretary of State Hillary Clinton, with about 85,000, and Donald Trump, with about 73,000. The main Sanders discussion forum, or subreddit, /r/SandersForPresident, offered not only discussion but opportunities to volunteer and raise funds for the candidate. 4Heavy commenting activity is concentrated among a minority of users. As we have found with other social networking sites, most users participate lightly, but heavy engagement is more common among a core group. Six-in-ten authors who posted at least one comment naming a candidate did so only once, while a quarter left three or more comments. Similarly, our 2015 study of local news habits found that less than one-fifth of commenters to Facebook pages run by news outlets left more than two comments. Another report found that just 12% of Twitter users tweeted 100 times or more during a four-week period. This post was originally published on Feb. 24, 2016, and updated on May 26, 2016, to reflect a revised weighting of the original data. For more details, see the report’s updated methodology.